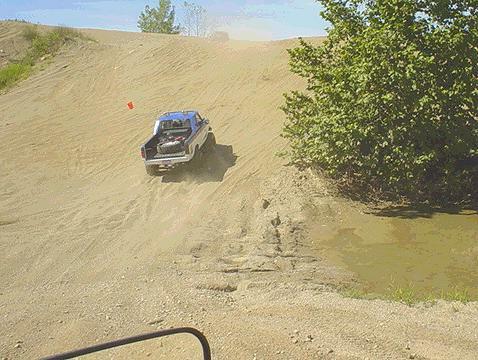 At the time TRS owner Jim Oaks asked me to host the Summer Round-Up at The Badlands, I had only been there a couple of times and didn’t know much about the place. The things I did know were that it was an hour west of Indianapolis; it literally had a sampling of every type of terrain possible; and it is notorious for damaging unprepared vehicles. It was this last point that I thought would be the greatest challenge. 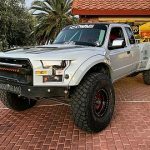 If you have been to a TRS event in the past, you know that TRS normally opens its arms to any vehicle that can meet our basic safety guidelines. 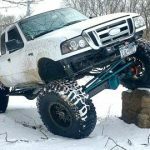 For this reason, I was assailed by images of dozens of nearly stock Rangers smashing their bellies on break-overs, hydro-locking in water holes, caving in their doors on rocks or worse-and then a finale of dozens of disappointed Ranger owners scrambling for a tow strap and a convenient sturdy tree limb. So, in what may be a TRS first, I decided to warn off vehicles that didn’t meet a certain criteria-though their owners were encouraged to attend as passengers, of course. 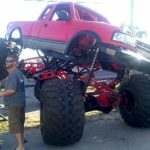 When the day of the Round-Up came and I saw the line-up of trucks in attendance, I almost decided to become a passenger myself. 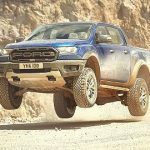 I had asked that Rangers be on 33s, Bronco IIs be on 31s and each truck have at least one locked axle. 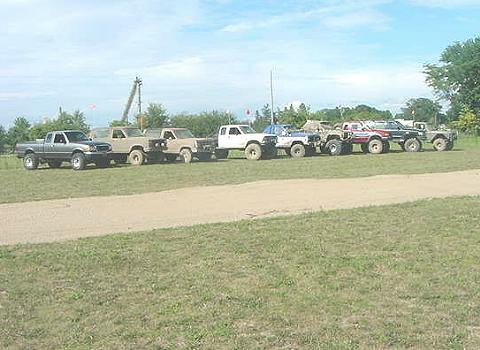 Most of the trucks that showed were on Dana 44s and 60s with 35+s and the list goes on. 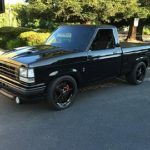 My Bronco II on 31s felt like the pace car at the offroad version of the Indy 500. Where I had been afraid I couldn’t find anything for a group of stock trucks to do, now I was suddenly afraid I couldn’t find something for a group of advanced trucks to do. 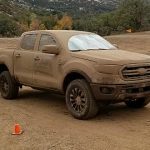 Fortunately I was prepared to destroy my truck in the effort, and besides, I could go anywhere in the park even if I had to bypass some of the tougher obstacles. I had feet didn’t I? We left the parking area and headed for the Green trails. 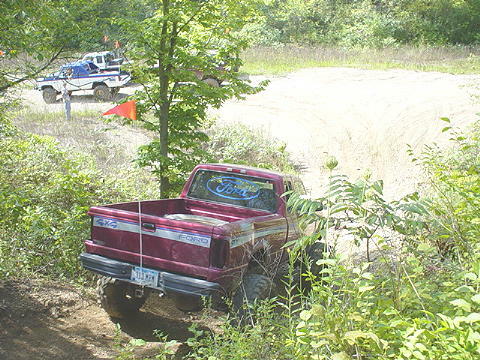 After playing on the climbs, ridges and break-overs, three of the trucks split off and headed to the Orange trails to wallow in the mud pits. The rest of us went over to run the Jeep Trails. You can literally spend the entire day in the Jeep Trail area of The Badlands. 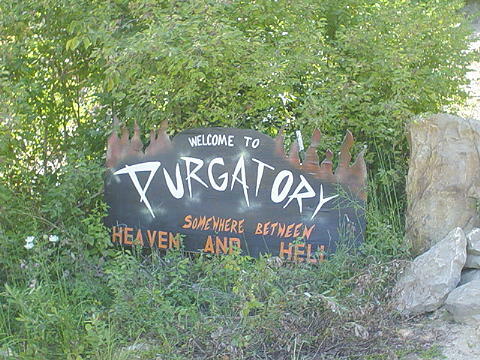 You have the quarry in the middle with rocky obstacles, like Purgatory, lining its perimeter. 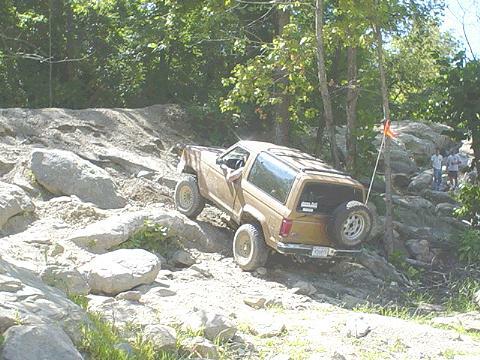 The Jeep Trails themselves basically surround the place are Greens and Blues with steep climbs in and out of the creek bed; small but challenging mud holes mixed in with the narrow, twisting trails; sharp climbs in loose rock; jungle trails; massive boulders and for the serious minded: the Pink trails. 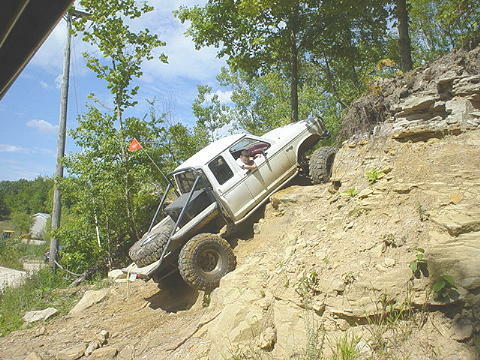 We spent hours working our trucks along the trails and playing on the rocks. 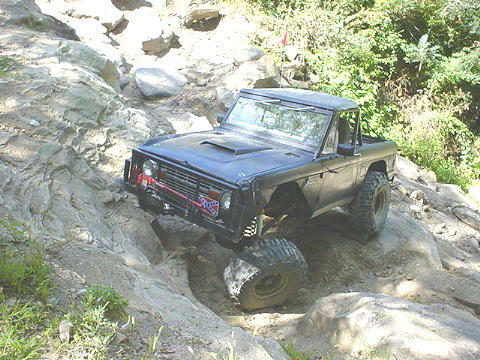 I even got my Bronco II up the easy side of Purgatory with only minor additions to the dent collection-as if anyone could notice. 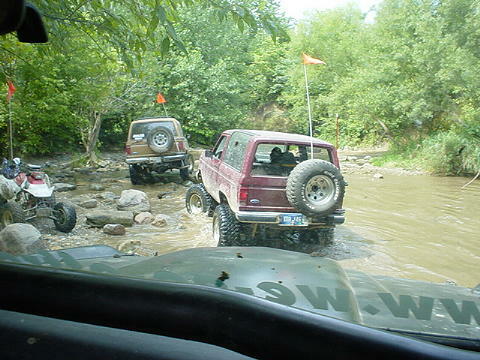 We finally exited the Jeep Trail area by climbing out of the creek near the tubes. Our only damage had been a blown hub and a broken tire bead. 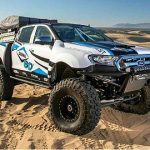 We spent some time climbing dunes and doing donuts-extremely good ways to blow off the tension of several hours of inching along rugged trails. 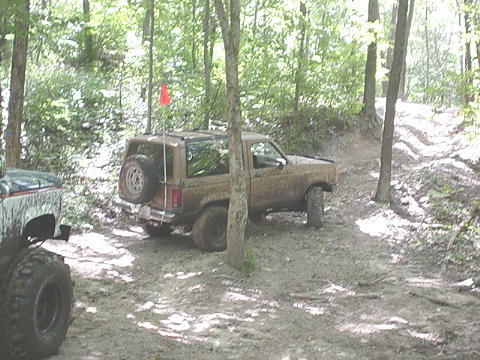 With an hour remaining before the park closed, it was decided to make another quick tour of the Jeep Trails and then, as a final act, a couple of trucks made some impressive climbs on the Pink Trail while the rest of us watched. We finally called it a day and well satisfied with ourselves, headed back to the campground via another quick pass over the Greens. Just have to get every minute in, don’t you? Back at the campground we met up with the guys that had split off to spend the day in the mud. Jim Oaks gathered everyone around and held a drawing for a stack of generous gift certificates from the Plano Texas 4-Wheel Parts store, A Randy’s Ring & Pinion Gift Certificate, Hella Lights from PTC Factory Outlets, a tow strap, spotlight and t-shirt from ProComp and a video from BFE Films. 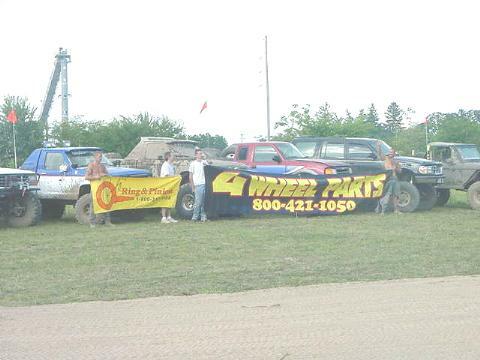 You can’t go out with a bunch of extremely modified trucks without learning something. Normally that ‘something’ is a mechanical trick or maybe a driving technique. 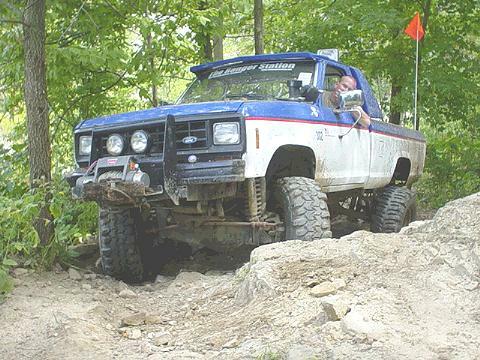 This trip, as spiders wove ‘Some Pig’ in the trees above my Bronco II, I learned something about attitude instead.